Juma teaching the "Relationship with God" lesson to the discipleship class at Harvest. 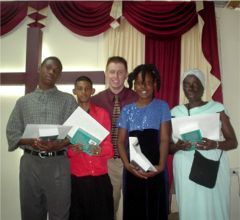 Sunday, May 1st, we had the joy of conducting our first discipleship graduation at Arouca Baptist Church. These students have successfully completed the GROWING Discipleship Course and continue to be faithful to church. From left to right we have Akeem Thomas, Larry Rampersad, Madonna Samuel, and Techler Roberts. 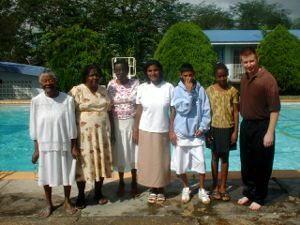 All but Akeem were part of our first baptismal service in January of this year. Akeem plans on following the Lord in believer's baptism at our next baptismal service. Please continue to pray that these that have completed the course will be faithful and continue to grow in the knowledge of our Lord and Saviour Jesus Christ! Click here for more pictures of the graduation! Now Playing: Youth Group Starts GROWING Program! Saturday, I had the privilege of introducing the program to the youth department at Harvest Baptist Church. In the last year, there has been explosive growth in the youth group and many of those who have recently started coming are new converts. Because of this Bro. Brian Rochester (youth pastor), thought it would be good to take them through the GROWING discipleship course. Last year at Harvest I taught a training class to instruct mature believers on how to take someone through the seven week GROWING Program. Bro. Brian plans on utilizing these believers in teaching the seven lessons in the course. This is a wonderful opportunity because both the young people and those teaching the class will benefit from this endeavour. Please pray for this class that will be taking place in the next several weeks. 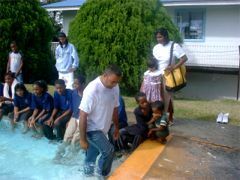 January 29th we had our first baptismal service at Arouca Baptist Church. It was a joint service between our church and our sister church, Harvest. 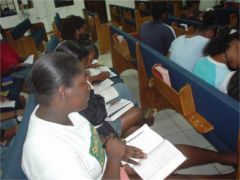 Many of those who followed the Lord in believers baptism were students of the GROWING Discipleship Course. Larry Rampersad has completed the course. My wife has been taking Techler Roberts and Madonna Samuel through the class, and both of them are very close to finishing. In addition to these, Sunil Ramjewan also followed the Lord in believers baptism. It has been a great blessing to see him come through the course, graduate , and be obedient in baptism. With the start of the new church Marie and I have recruited several new people for the GROWING course. The young man pictured to the right is one of the "recruits"! Akim received Christ during the crusade. The next week he brought his friend, Larry, to church and, Larry, got saved. 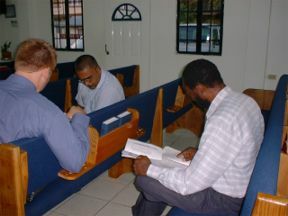 Now I am discipling them on Sunday mornings before the main service. In addition to this, Marie and I are discipling a family on Thursdays, and this Wednesday, Marie will start the course with a group of ladies. Pray that God will work in these small group Bible studies and that we will see these people well grounded in the word of God. 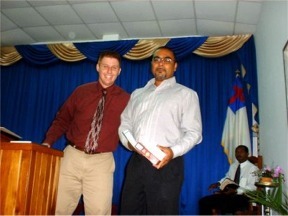 Sunil successfully completed the GROWING Discipleship course and graduated November 7, 2004! Sunil said that he enjoyed the course and felt like he had learned alot. Continue to pray that Sunil will be faithful to church and continue to grow in his christian life. Several weeks ago Sunil (the man sitting on the same pew as me) came to Harvest Baptist Church for the first time. Not long after that I got a call from Bro. Ken Guth, a fellow missionary on the island. He asked about Sunil and explained that Sunil had recently recieved Christ at a family camp sponsored by the church Ken is working with. 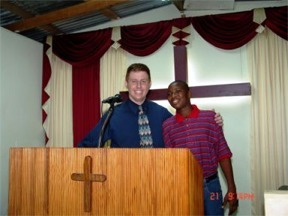 Ken thought it would be a good idea to get Sunil involved in our GROWING Discipleship program. Yesterday, was Sunil's second week and he is progressing well! The man to the right of the picture is, Juma. You may remember his picture from my newsletter that featured the graduates of the Discipleship Leader's class, a 12 week class that instructed mature believers how to disciple a new convert. Juma and I are alternating teaching the lessons to Sunil. This will give Juma hands on experience in discipling without being overwhelmed. In addition, it will allow me to see how well I taught the concepts of discipling to Juma. Please pray for Sunil. This week he was sick, but he had such a desire to learn that he came to class anyway. He told Juma and I that everytime he tries to do something for God or better himself in anyway, this kind of stuff happens. Juma and I, explained how our enemy satan doesn't like to see us do things that please God, but we encouraged Sunil to "keep at it", realizing that God will bless his faithfulness!